I'm at the Isaiah Wall that is directly across the street from the United Nations building. It is 8:30 AM, and across the street delegates to the NPT Non-Proliferation Treaty Review Conference are entering the building as it begins its second day. Police vans are pulling and making their preparations for the expected onslaught of nuclear abolitionists who will soon arrive for the 9:30 vigil here and the subsequent nonviolent direct action at the US Mission to the United Nations just down the block. The sun is shining and the tree in front of the Isaiah Wall is bursting with the beauty of Spring. In an instant all this could disappear in a blinding flash and, quite ironically, Isaiah's words just might remain while every living thing around it would be vaporized or incinerated, the shadows created from their ash etched into the stone surface. The letters etched into the stone of the wall are a relatively permanent reminder of the words of the prophet Isaiah who, like most prophets, have been ignored through the centuries by leaders of so many nations and those who follow them blindly into the madness of war. Yet many people have resisted and called humanity to something better. As I walked up the steps circling up by the wall I saw, at the top of the stairs, an icon of the Cold War - the days of duck and cover, of bomb shelters and mutually Assured Destruction. 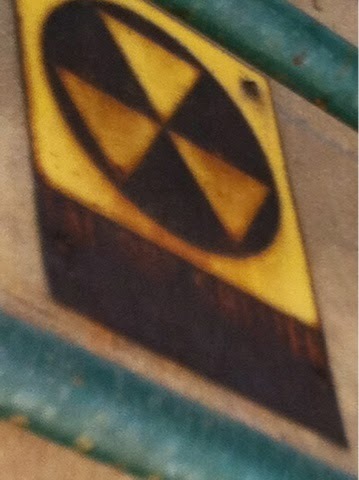 It was a rusting fallout shelter sign over a nondescript door. It was a stark reminder of my childhood, when students at my elementary school would walk from the school roughly a mile or two to the nearest official fallout shelter during the many Civil Defense drills held in those days. It was also a reminder of Dorothy Day and other resisters who, during the Cold War, refused to enter the fallout shelters in New York during the drills, and were arrested for doing so. this morning above a doorway overlooking the Isaiah Wall. Some of the participants in today's action will engage in active resistance to the nuclear weapons policies of the US, and in the spirit of Dorothy Day and so many others, blocking the entrances to the US Mission to the United Nations, risking arrest for their actions. The name of today's action is "SHADOWS AND ASHES: Direct Action for Nuclear Disarmament." We go forward together this morning in the spirit of nonviolence, with Isaiah's words etched on our hearts. May those words reach those gathered at the UN, and may we beat our swords into plowshares, and may we make war no more!